I have long praised my love of a fabulous pair of blue shoes. When I came across the pair for this week's Tuesday Shoesday feature from Shop Sosie, I knew they were a winner. They are every bit summery like a classic checkered picnic blanket or table, and I love how geometric they are and all of the straps near the front. Oddly enough, they immediately reminded me of the Kate Spade Saturday dress on the left. 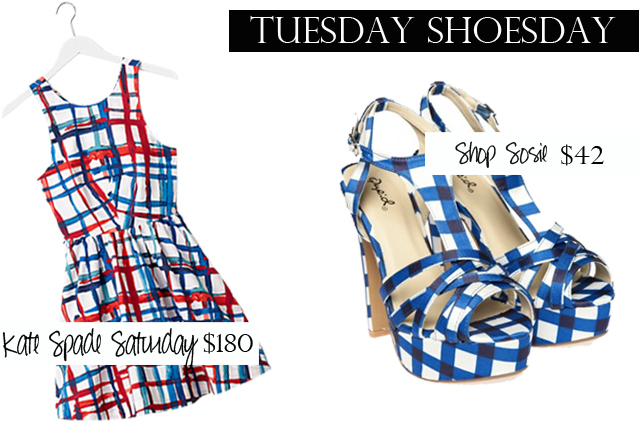 With it's painterly abstract plaid and fun strappy back, this pairing is whimsically similar. I'd love to see what they would look like paired together. Too crazy or pattern perfection?